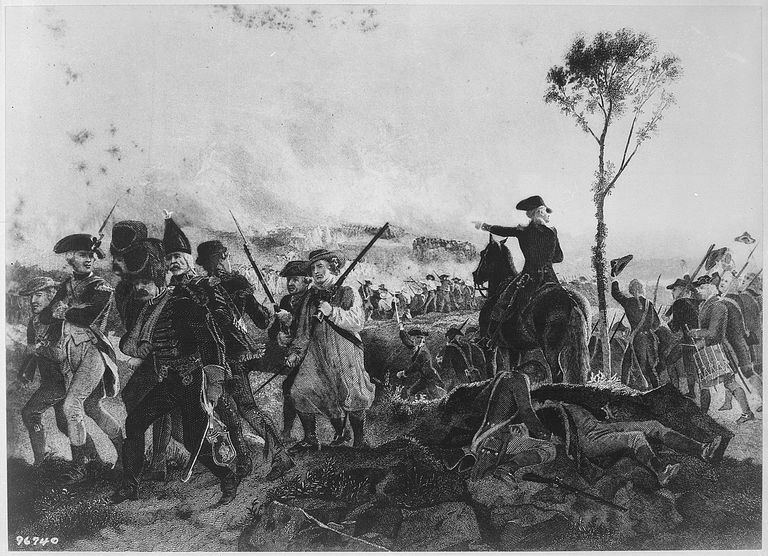 The Battle of Bennington was fought during the American Revolution (1775-1783). Part of the Saratoga Campaign, the Battle of Bennington took place on August 16, 1777. During the summer of 1777, British Major General John Burgoyne advanced down the Hudson River valley from Canada with the goal of splitting the rebellious American colonies in two. After winning victories at Fort Ticonderoga, Hubbardton, and Fort Ann, his advance began to slow due to treacherous terrain and harassment from American forces. Running low on supplies, he ordered Lt. Colonel Friedrich Baum to take 800 men to raid the American supply depot at Bennington, VT. Upon leaving Fort Miller, Baum believed there to be only 400 militia guarding Bennington. While en route, he received intelligence that the garrison had been reinforced by 1,500 New Hampshire militiamen under the command of Brigadier General John Stark. Outnumbered, Baum halted his advance at the Walloomsac River and requested additional troops from Fort Miller. In the meantime, his Hessian troops built a small redoubt on the heights overlooking the river. Seeing that he had Baum outnumbered, Stark began to reconnoiter the Hessian position on August 14 and 15. On the afternoon of the 16th, Stark moved his men into position to attack. Realizing that Baum's men were spread thin, Stark ordered his men to envelop the enemy's line, while he assaulted the redoubt from the front. Moving to the attack, Stark's men were able to quickly rout Baum's Loyalist and Native American troops, leaving only the Hessians in the redoubt. Fighting valiantly, the Hessians were able to hold their position until they ran low on powder. Desperate, they launched a saber charge in an attempt to break out. This was defeated with Baum mortally wounded in the process. Trapped by Stark's men, the remaining Hessians surrendered. As Stark's men were processing their Hessian captives, Baum's reinforcements arrived. Seeing that the Americans were vulnerable, Lt. Colonel Heinrich von Breymann and his fresh troops immediately attacked. Stark quickly reformed his lines to meet the new threat. His situation was bolstered by the timely arrival of Colonel Seth Warner's Vermont militia, which aided in repulsing von Breymann's assault. Having blunted the Hessian attack, Stark and Warner counterattacked and drove von Breymann's men from the field. During the Battle of Bennington, the British & Hessians suffered 207 killed and 700 captured to only 40 killed and 30 wounded for the Americans. The victory at Bennington aided in the subsequent American triumph at Saratoga by depriving Burgoyne's army of vital supplies and provided a much-needed​ morale boost for the American troops on the northern frontier.